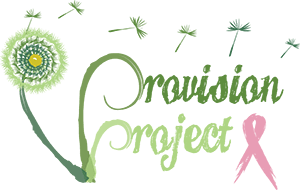 The mission of Provision Project is to provide financial relief to women in active treatment for breast cancer. One of the things that bonds people together most is a common enemy. Breast cancer is our enemy here at Provision Project. Every member of our board has been affected by breast cancer, either directly or through a close family member. It is an insidious, devastating disease. Breast cancer changes you. It changes your body. It changes your emotions. It changes your family. It changes your friends. It changes your finances. It changes your life. We have united here against our common enemy because we have seen what the pressures of breast cancer do to the decision-making process of a woman in the middle of a fight for her life. Should she pay her co-pay to get chemo, or should she keep the electricity on at her house? Should she pay for her pain medications or buy food for her children? Should she find a way to pay for a PET scan recommended by her oncologist even though it’s not covered by her insurance? These questions aren’t fair. But breast cancer is an equal opportunity destroyer. Provision Project wants to help women who face difficult financial decisions as they are actively being treated for breast cancer. We are here to bridge the gap when we can. We are here to give help. We hope you’ll join us.